Heavy Rain (HEAVY RAIN(ヘビーレイン), Heavy Rain?) is a PlayStation 3 game, developed by French studio Quantic Dream. The game was directed by Quantic Dream's founder and CEO David Cage, who also wrote and directed the studio's two previous games, Omikron: The Nomad Soul and Fahrenheit. The game was released in February of 2010, worldwide. 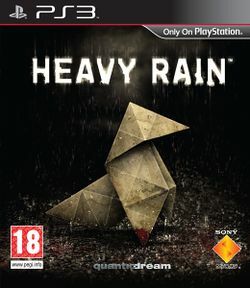 Downloadable episodes, titled The Heavy Rain Chronicles, were planned to involve other stories with the Heavy Rain characters, before or after the events of the main game. One chronicle was released, The Taxidermist, although it was delayed until March 4, 2010 everywhere but the UK due to technical difficulties. It was subsequently announced that no more DLC will be forthcoming, as the studio began focusing more on support for the Sony Move. Heavy Rain is an interactive story with its plot arcs heavily influenced by player decisions and the success or failure of numerous quicktime, button-pressing events. Actions taken throughout the game affect how the story plays out and how different characters interact with each other. Unlike traditional goal-oriented games, dying or failure does not halt progression of the story and many game endings are possible. The game focuses on four characters, all controlled by the player at various times, whose lives are intertwined during the events surrounding the Origami Killer. The unknown killer abducts young boys in the fall and drowns them in rainwater over the course of several days. His calling cards are orchids left on the victims' chests and origami figures left in their hands. While the entire city has been on a manhunt for the killer with no leads for two years, the four characters, each on separate and sometimes overlapping paths, are attempting to solve his murders. Ethan Mars is the latest parent of an abducted child and is put through a series of ever more grueling tasks to save his son, Shaun. Scott Shelby is a retired policeman, now working as a private detective investigating the Origami Killer case on behalf of the prior victims' parents. Norman Jayden is an FBI agent on loan to the city police department, tasked with cracking the case with technologically advanced investigative methods. Finally, Madison Paige is an uninvolved journalist with insomnia, who happens to run into Ethan and is subsequently drawn into his attempt to rescue his son. This page was last edited on 9 July 2016, at 18:27.